If you would like a traditional or contemporary Christmas tree the options are endless. From a real Norwegian Spruce to a pile of logs in the shape of a tree any room can be full of festive spirit with a tree and tinsel! So, when you are getting ready for Christmas why not try something different and use fire logs piled together in the shape of a triangle to give a modern festive flair. This way of piling logs makes a Christmas tree shape that you can then decorate in the colour scheme you prefer or leave it as it is for a modern, rustic look. To decorate any type of tree, why not go for a walk and find some pine cones in the park, woodland or from your own garden. They are perfect for making your own Christmas tree decorations as you can dust glitter on them or paint to hang on the Christmas tree or decorate around the home for a lovely Christmas feeling. They are easy, cheap and quick to make plus great fun for kids to join in as well. While you are getting ready for Christmas don't forget the front door. It is the first thing your Christmas visitors will see and a great welcome to your home. There are many wreaths available at this time of year and many are made from natural materials. If you can’t find one you love to purchase, you could try making one yourself from garden materials. 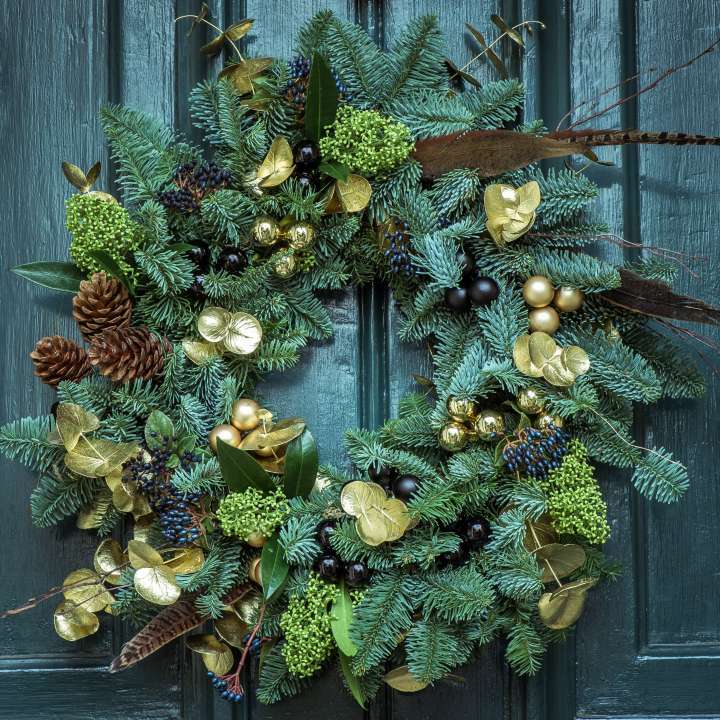 You’ll need a wreath ring, some string and wire plus some foliage and berries from your garden. Why not add in some baubles or tinsel. They are very easy and fun to make so let your creative juices flow over a glass of mulled wine. If you have some topiary by your door, why not add some pretty twinkling fairy lights for added sparkle. We always focus on decorating the inside of our homes over the winter when we are getting ready for Christmas but your garden can be made just as festive, especially if there is snow! Hang netted lights on hedges, put a sparkly reindeer on the lawn and decorate an outside Christmas tree with festive treats for your garden birds.